SUNOL, Calif. -- The California Highway Patrol has reopened southbound Highway 680 near Sunol just before 3:30 p.m. following an earlier traffic accident involving a big-rig tanker truck leaking fuel. At 8:47 a.m. on Friday, CHP officers responded to a report of a big-rig truck blocking the highway's southbound slow lane, just south of Andrade Road, according to CHP officials. The truck apparently hit a tow truck along the highway, which then caused it to leak ethanol, CHP officials said. Fire crews arrived on scene at about 9:10 a.m. to assess the spill. 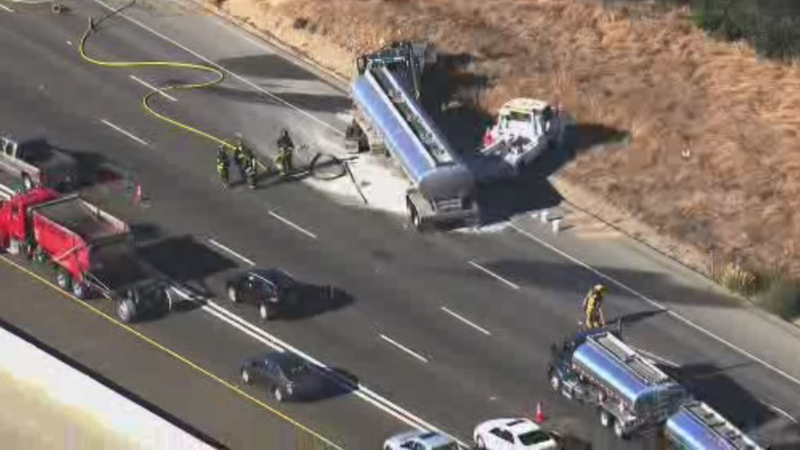 They then called a hazmat team, according to the CHP. At 9:43 a.m., the CHP issued a Sig-alert for the highway, closing all the southbound lanes and advising drivers to exit at Andrade Road and take alternative streets. At 10:06 a.m., the CHP decided to close the highway's southbound lanes at state Highway 84. Additionally, the CHP also closed eastbound state highway 84 to southbound state Highway 680. The CHP did not say when the highway would reopen.